Bracted orache is an annual plant in the Chenopodiaceae family that resembles lamb's quarters in growth form. It tolerates the harsh maritime locations around the northern Atlantic Ocean. 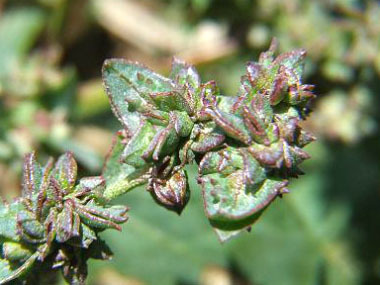 There are many plants in the genus Atriplex making the taxonomy extremely difficult, and remains in a state of flux. Compounding the problem is the fact that even specialists tend to have trouble identifying individual specimens. The good news is that they are all edible. The species name glabriuscula comes from the Latin glaber and means 'who become bald'. This plant is wind pollinated. Distinguishing Features: The leaf size and outline has several variations from the base to the apex of the plant. The most constant and characteristic leaves are those on the central axis in the middle of the plant. Mature leaves are triangular and margins tend to be lobed.Leaf petioles are mostly purple/red where they meet the stem. Flowers: Bracted orache flowers are modest and unisexual. Staminate flowers 5-lobed perianth and they have 5 stamens. Pistillate flowers lacking perianth, are enclosed by two erect, mealy bracts, and stalkless in the clustered flowers. Bracts are almost stalkless, 2 to 7 mm (0.08– 0.28”) long, single veined, with entire margins or small-toothed. Blooms from August to September. Fields of Nutrition has medicinal benefits and vitamin/mineral content of Bracted Orache. Leaves: Leaves grow opposite, are fleshy, slightly mealy (with glandular hairs) when young. The blade is triangular, usually with entire toothed margins. Upper leaves narrower than lower leaves. Height: This plant grows 10 to 50 cm (4 to 20”). On the ascending stem there are many smaller stems that branch out. They tend to be striped, often blotched purple/red at the petioles or completely reddish/purple. 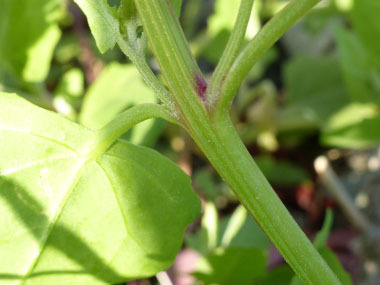 Stems are weakly ridged. 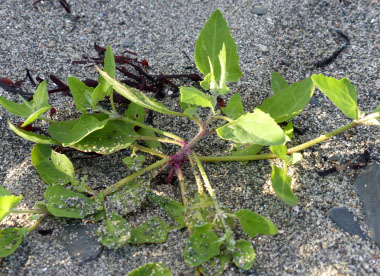 Habitat: This orache likes sunny locations along saline or brackish marshes and saline coastal areas. 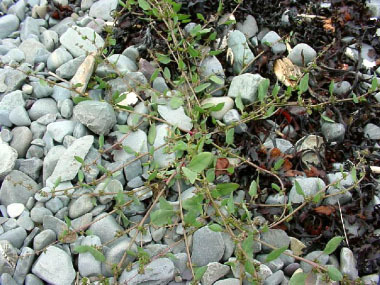 The bracted orache grows along coastal areas of eastern Canada, northeast U.S, northwest Europe, the UK, Greenland and Iceland. It is also found in Manitoba, Saskatchewan, Illinois, Kentucky, and Minnesota. 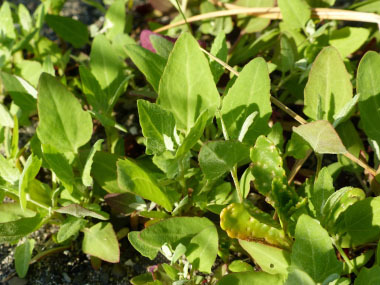 Edible parts: Young leaves can be eaten raw (in small quantities) or cooked. Seeds can be ground into a meal and used as a thickener or mixed with flour in making bread. 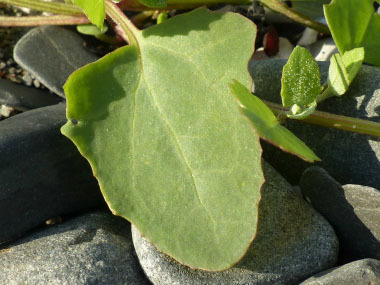 Similar plants: Hastate leaved Orache, Spear leaved Orache.